Ctrl Shift I – Open developer tools. Ctrl Shift P – Search within file. Displays all functions within a file. Ctrl P – show js files. Type to search. To disable cache – Network tab – disable cache (while DevTools is open). Add timestamp to events displayed in console – Settings – General – Console – Show timestamps. Go to chrome://flags – Enable Developer Tools Experiments. Install a DevTools Theme. Here’s one. Do not use username “admin” – when someone tries to brute-force into your site, this will likely be the first username they try. Keep your WordPress and plugins up to date. Use a password manager to store your passwords. This will allow you to use strong passwords for your site (and anything else) without committing your memory to remembering all of the combinations special characters, letters and numbers. Akismet – a very effective option to detect and block spam comments from your blog. Wordfence (free/paid) – a free version allows to scan your source code, themes and plugins; set up limits on login attempts; sent email notifications when somebody logs in to your site or enters invalid credentials. If the number of users who can login to you site is relatively small, I recommend immediately locking out the users who try to log in with an invalid name, which is an excellent option to defend against brute-force attacks. A paid version allows to set up two-factor authentication, country-blocking, advanced spam scan options. IQ Block Country (free) – you can combine it with the Wordfence to get additional protection for country blocking if you don’t want to pay Premium for Wordfence. IQ Block Country allows to block certain countries (determined by IP) from logging to either your frontend or backend pages. There is a potential that Wordfence and IQ Block country may conflict with each other; I have used both plugins without experiencing any conflicts. When considering country blocking, you may want to check your Spam folder to see where most of your spam comes from; or if you already use Wordfence – it can tell from which countries most of the invalid logins orginate. Use this information to lock your back-end or front-end. I found country blocking surprisingly effective against spam. While you are there, you can experiment with batch parameter. It is used to control whether the initial page request will continue to compile additional files in the same directory before completing the original request. I prefer to set it to false. You have to delete or rename the originalSourceCodeDirectory prior to running mklink command. Move your bin/obj folders to RamDisk. Use symbolic links to avoid configuration problems. This did not seem to have any noticeable effect on my configuration, but your mileage may vary. Use some caching software like PrimoCache. It allows to cache data either to your RAM or an additional SSD. The most beneficial of these techniques for me was moving source code to SSD. This is a guide for passing custom objects to Fluent Validators. This can be helpful for more complex validation scenarios. Since we want FluentValidation to handle all situation when OurModelValidator is not applicable, we use built-in ValidatorFactory to return default Validator when validating anything but OurMVCViewModel. FluentValidation is “A small validation library for .NET that uses a fluent interface and lambda expressions for building validation rules for your business objects.” It is quite awesome. However, the provided client-side validation is limited: “any rules defined using a condition (with When/Unless), custom validators, or calls to Must will not run on the client side.” Below is some my first take on using FluentValidation on both server and client-side. First, you need to install the nuget package. In our case, it is FluentValidation.MVC4. //This is not a server side validation rule. So, should not effect at the server side. // which is the containing object (our Person), and hence the same level as the dependent property. //Make SomeProperty required. It will be validated on server and client side. //SomeOtherProperty will be validated on server side - it is required when PropertyB is true. This is an overview of my effort to upgrade some of our old 2003 servers to Windows Server 2012. It is quite possible there are better ways to accomplish this, as I’m just a developer and server upgrade is not something I do… well it was the first time I did it. First, I needed to migrate IIS applications, app pools and app pools account. In order to automate this as much as possible, I installed Microsoft Web Platform installer on 2003 and Web Deploy 3.5 (The Web Deployment Tool). I used this guide http://www.iis.net/learn/publish/using-web-deploy/synchronize-iis-60-web-sites to help me. The password is required since we are exporting App Pools and the identities they use (by specifying enableLink:AppPoolExtension). Restore it on the destination server. This almost takes care of all the shares, except for NTFS permissions. First, install Windows Server Migration. Then use SmigDeploy to migrate users and groups. Go to Source server and run from userMigrationTool folder (created in a previous step). This will register SmigDeploy on source. It’ll ask you a password. Pick one. Since I needed to migrate some COM’s, I had to add a feature COM+ Network Access to enable COM. Open Task Scheduler on destination. Go to Action – Connect to another Computer. Connect to your source server. Export the tasks to a temporary location as xml files. I didn’t see a way to export them all at once, so I did it one by one. Open Task Scheduler on your destination again. Import the tasks. Click “Add User or Group”, and include the relevant user. Error SB4062: The “Microsoft.TeamFoundation.Build.Tasks.BuildStep” task could not be loaded from the assembly C:\Program Files (x86)\Microsoft Visual Studio 11.0\Common7\IDE\PrivateAssemblies\Microsoft.TeamFoundation.Build.Tasks.dll. The solution was to replace my local file from C:\Program Files (x86)\MSBuild\Microsoft\VisualStudio\TeamBuild\Microsoft.TeamFoundation.Build.targets with the one from a different machine with a working build. Not quite sure why I had an older targets file. Possibly, at some point I installed an older version of Visual Studio and it updated the .targets file with the older version. I had some free time recently and decided to learn a truly wonderful library SignalR. SignalR provides the “ability to have your server-side code push content to the connected clients as it happens, in real-time.” It eliminates the extra work of checking browser compatibility with whatever technology you decide to use for pushing the events to the client (WebSockets, EventSource, Long Polling, Forever Frame). Once this line was added to the configuration and deployed, my simple Chat client started working. 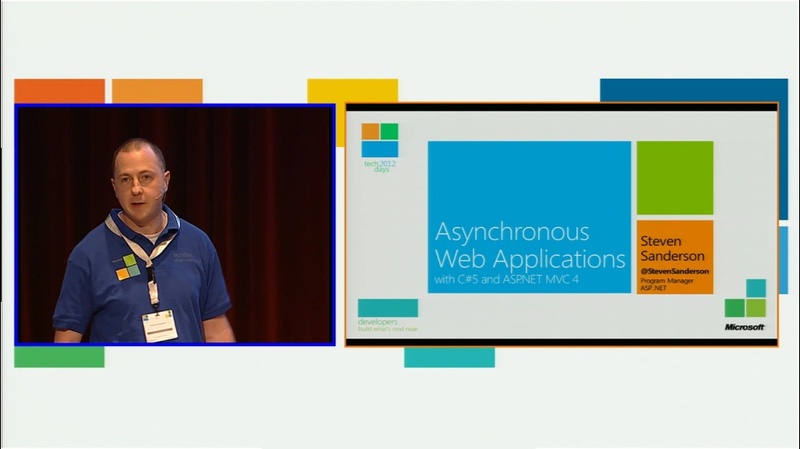 This is a great explanation of async methods and why to use them in Web applications.